Début novembre 2017 (le mois “anniversaire” de mes 30 ans de radioamateurisme…), j’ai eu l’immense plaisir de recevoir le diplôme Worked All States (WAS) numéro 208 sur 144 MHz. Il récompense le fait d’avoir contacté au moins une fois chaque état américain, en l’occurrence par réflexion sur la lune en ce qui me concerne. Avant de l’obtenir, il a fallu également collecter et faire vérifier toutes les cartes QSL. La station, ou plutôt les différentes stations utilisées au fil des ans sont restées relativement modestes, le tableau ci-dessous renseigne antennes et puissances utilisées. 35 états ont pu être contactés avec une seule antenne et sans élévation, mais certainement en profitant de “gain de sol“, difficile à quantifier précisément, mais de l’ordre de 4-5 dB. Merci à tous, et en particulier à Gene, KB7Q (qui a activé plusieurs états rares) et à Jim, N1NK (qui m’a permis de contacter le dernier état tant attendu, Rhode Island). 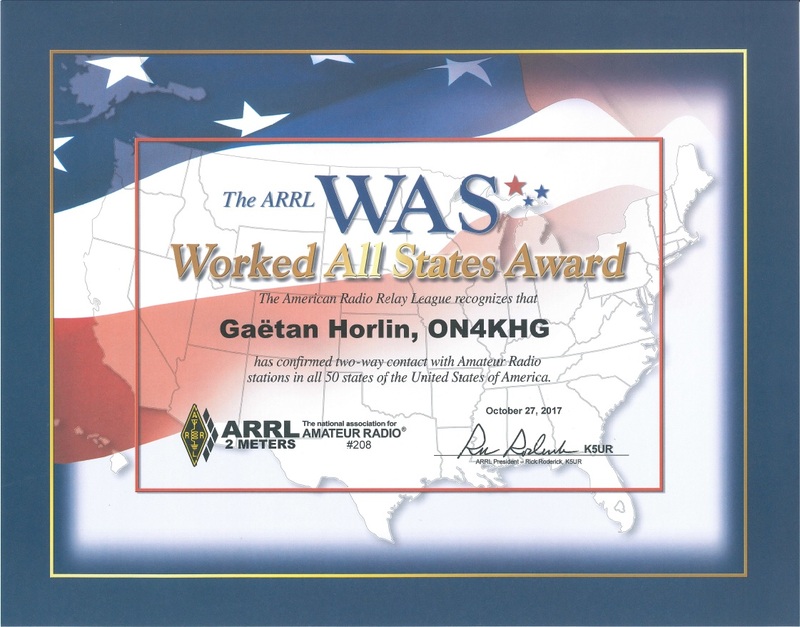 Beginning of November 2017 (the “anniversary” month of my 30 years as ham radio…), I have had the great pleasure to receive the Worked All States (WAS) award number 208 on 144 MHz. It rewards the fact of having worked at least one time every US state, thanks to moon bouncing in my case. Prior to get it, it has been needed to collect and make check all the QSL cards. The station, or rather the stations used over the years have remained relatively modest, the table below indicates which antennas and powers have been used. 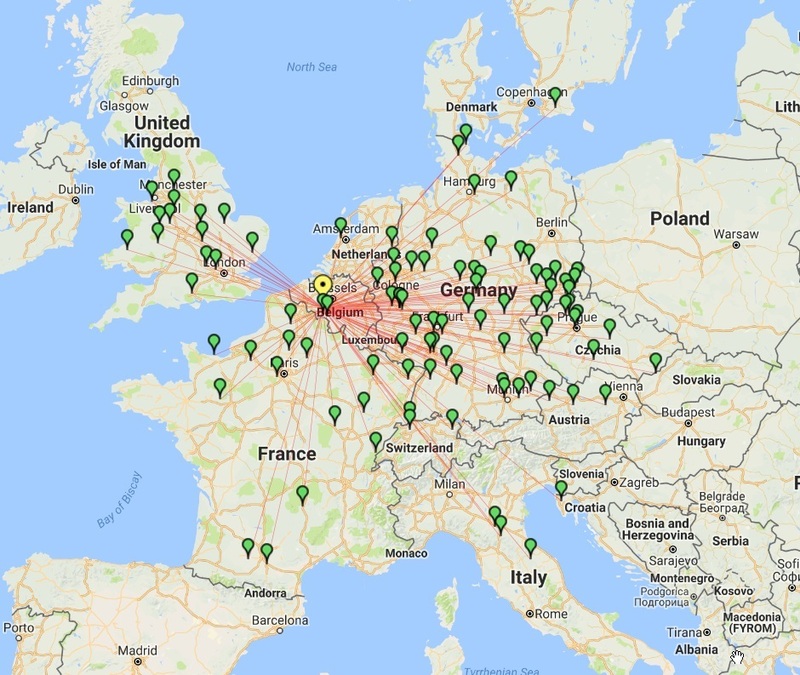 35 states have been worked with a single antenna without elevation, but certainly benefiting from “ground gain” (in French), difficult to quantify precisely but somewhere around 4-5 dB. Thanks to all and in particular to Gene, KB7Q (who activated several rare states) and to Jim, N1NK (who allowed me to work the last long awaited state, Rhode Island).